We all wish that our world were a platform for harmony and for pleasure. The reality, however, is that while there is harmony and pleasure here on earth, there is also conflict and suffering. Every day traumatized soldiers return from war. Inhabitants of war-torn areas struggle to pick up the broken pieces of their lives and move forward. Children are abused, women are raped, and natural disasters leave people with nothing. Emergency teams, such as ER doctors, first responders, and firefighters, assist others through horrific circumstances and often find it difficult to process the distress of what they have experienced. Others succumb to addiction to try to drown out the pain of emptiness. All of the difficult circumstances that we struggle with have one thing in common: Trauma. Drawing on her wide range of extrasensory abilities—including clairvoyance, clairsentience, and clairaudience—and incorporating key aspects of inner child and shadow work, Teal offers a revolutionary 20-step process for healing any past hurt or present problem. Creation of a Safe Haven — a crucial first step to set up a totally safe mental space, where the child aspect of a painful memory is taken to once the original memory scene is resolved. Validation — giving the painful emotion the message that we see it as valid. Seeking Origin — asking, “When was the first time I felt this feeling?” to connect to the root of it. Awaiting Relief — inside the memory, letting the feeling naturally shift in the direction of relief. Teal Swan’s previous book, Shadows Before Dawn, told the incredible story of how she survived 13 years of horrific physical, mental, and sexual abuse at the hands of a cult member in her community. After her escape at age 19, she forged a path back from the edge of despair and began the long process of making herself whole. Now, The Completion Process takes readers along on her restorative journey of healing and liberation. For anyone who has been fractured by trauma—and according to Teal, in one way or another, we all have—here is a way to put ourselves back together again, no longer inhibited by the past or terrified of the future. Teal does it again! Her extraordinary process will save you years of psychological and emotional struggle. She teaches you to go into your pain fearlessly instead of running from it, and to find the causes and solutions to everything that keeps you from a fulfilling life. She will help you recover your soul and write a new story of your life! 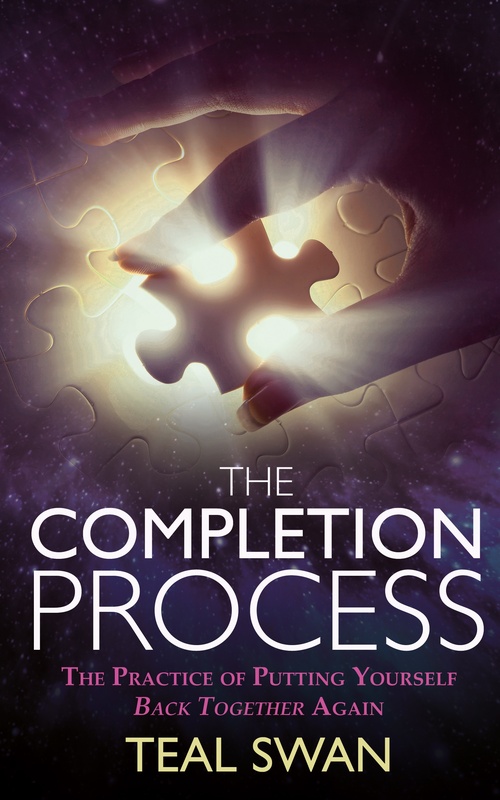 The Completion Process' is a must-read for anyone who has experienced trauma of any kind. Teal Swan brilliantly provides us with the necessary information about how we become branded by highly charged emotional events and then, from personal experience, she offers us a true healing process by giving us the practical tools to apply to our lives. This book will free you from your past. I think the human race is going to evolve into a more peaceful race. And this process of healing from old personal trauma is a significant and necessary step in that evolution. So I think what Teal is teaching the whole world will be using in 15 years or less.